Discover and re-ignite your inner creative Fire, also known as Shakti, that resides in the heart. When it’s alive, the divine feminine creative power is free to manifest the heart’s deepest desires. We will allow this unique dance to be the teacher of our true nature, honoring the natural cycles and rhythms that are universal to all Life. In essence, this retreat is a spiritual and somatic wisdom course bridging the scientific “how” with the human “why”, a blend of theory and movement, dialing into the most essential elements of the human healing experience. Harmonize your mind, body, and soul with revolutionary, neurological re-patterning and restoring practices that have transformed countless lives toward expanded new ways of moving, thinking, and being. Whether you’re new to poi or the hula-hoop or have practiced for years, this retreat is designed for you to experience these modalities as transformational tools and ideal for anyone interested in incorporating the flow arts into their personal or professional practice. Join Dr. Jinju Dasalla and Soul Flow Luminaries as they share the art and science that grounds the therapeutic benefits of these playful practices. In addition, you’ll earn credit hours and a certificate of completion that can be applied to the Soul Flow Arts (SFAI) Teacher Training and Coach Certification Program. Imagine spending a long weekend in colorful, southern Colorado and relaxing at the world famous Springs Resort & Spa in Pagosa near the San Juan mountains. Wake up with a flowing yoga practice and nourish your body with 3 catered, vegetarian meals a day. Then, whenever you wish, soak in any one of the 23 pools (available to you 24 hours/day) containing the healing waters of the famous Pagosa Springs, home of the world’s deepest, geothermal hot spring or sunbathe next to the San Juan River. Hoops and poi will be provided and available for purchase. Release tensions, trauma, and old holding patterns in the body leaving you feeling lighter, stronger, and healthier through this unique somatic movement practice. This retreat has a limited number of spots, so be sure to register early! All participants must be ages 18 and up. While this program may be healing and therapeutic in nature, it should not be mistaken for therapy. * A double bed isn't ideal for 2 people, but it's the most cost-effective option for those on a budget. A room of 4 sharing 2 queens doesn't offer much value (a savings of approx. $50/day) - it make may more sense to pay a little more to share a room with only 1 person AND have your own bed. 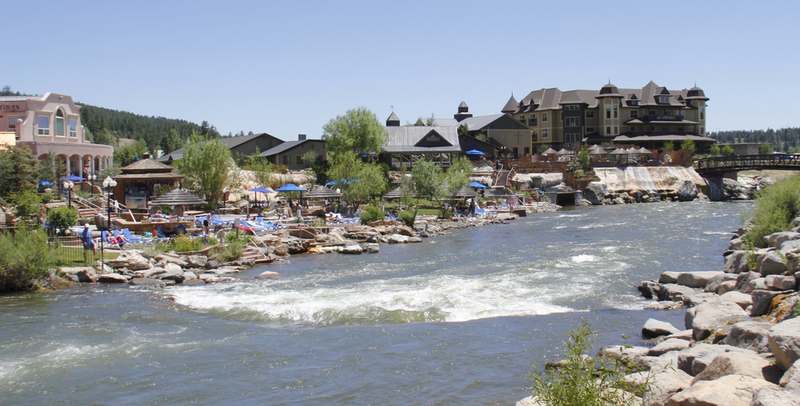 The Springs Resort hotel has three lodging buildings, all just steps from the hot springs pools, offering 79 rooms in: Classic, Deluxe, and EcoLuxe room or suite accommodations. A geothermal heating system, derived from the naturally hot "Mother Spring", which heats all our resort buildings and also provides hot water to the resort for additional operations. All hotel rooms are smoke-free. Standard rooms are located in the original Spring Inn Motel building. All Standard rooms are on one level and are the closest accommodations to the Bath House and soaking pools. Relax in a room with two double beds or 1 king, full bath, coffee maker and free Wi-Fi. Parking is available in spaces right in front of your room. The spacious Deluxe rooms feature two queen beds, or one king bed, kitchenette with microwave, mini-fridge, coffee maker, toaster, flatware and dishes. Our deluxe rooms are available on first or second floors. The one bedroom Junior Luxury Suite features two queen beds and flat screen TV. The living area comes with a queen sofa sleeper, a flat screen TV and a kitchenette with microwave, mini-fridge and coffee maker. They suites are housed in a 29-room, luxury green-built building designed and constructed and certified to Leadership in Energy and Environmental Design (LEED) Gold standards. This is the first LEED-built hotel in Colorado and one of only 22 in the nation. You can see what the rooms like here. Jinju received her Ph.D in Neuroscience from Penn State College of Medicine & 200RYT from the Hawaii Yoga Institute. the physical, creative and spiritual realms to merge into one. We will be catering fresh, healthy, organic, vegetarian fare for you this weekend, starting with a hearty dinner on Thursday night and ending with breakfast on Sunday morning. We are very pleased to have Mia Rosignana from Sprouted Nutrition catering the retreat. Mia will cook us seasonal vegetarian fare with gluten free and vegan options, which will nurture our bodies. Most groceries are purchased from the health food store, farmers market or directly from the farmer so that they come to you fresh, organic and local! Transportation is not included in the retreat. Please make your own way to Pagosa Springs, which is approximately 5 hours away from Denver. We can help coordinate carpools if needed.